Bali Mauladad - The Legendary Hunter of the 60's | In the Golden Age of Safaris Bali Mauladad was one of the most prolific hunter in Africa in the 60's. This is about his life. Bali Mauladad – The Legendary Hunter of the 60's In the Golden Age of Safaris Bali Mauladad was one of the most prolific hunter in Africa in the 60's. This is about his life. Bali Mauladad, with the King and Queen of Nepal on their East African Safari. 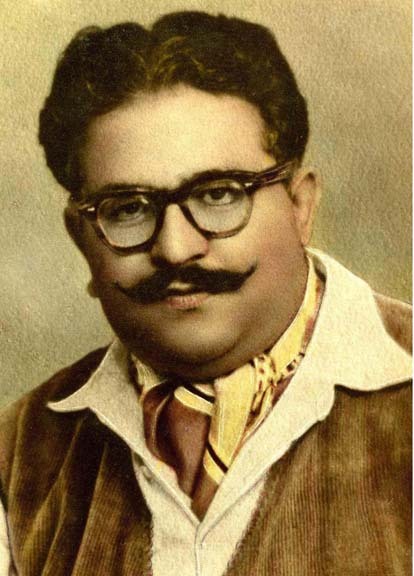 Iqbal Mauladad was known to all as Bali. He was such a jolly, warm-hearted man that people used to say his heart was as big as Bali himself. Born in Nairobi, Kenya in August 1926, Bali is the son of the late Mr. Mauladad who was a well-known building contractor. You can’t mistake Bali Mauladad; once seen never forgotten. Any man 6′ 1″ in his socks, and weighing 2501b. deserves the soubriquet, Hefty”. He has black hair, almost black eyes, and a near R.A.F. type moustache. Bali started hunting as a sportsman when he was 17 years old. He became a Professional Hunter when he was 26 years old. He was entitled as the ‘white hunter’ and his clients included famous Hollywood names. His most important clients includes; The Majesties “The King and Queen of Nepal”. Bali hunted with the famous Simba Mbili, Abdul Hamid Khan, who earned this name by killing two lions with one bullet at Mtito Ndei. He had two main hobbies: Motor Racing for which he was very well known and Animal Photography. i typed in the name Mauladad, as i was reseaching some old stories my parents tell me . My mother tells me of some distance relative of hers who went over to africa from pakistan . the name Mauladad was mentioned as a building contractor and hunter . was Mauladad originally from Pakistan? Very informative about the White Hunter. I am sure both your father as well as your grandfather would be extremely proud of you to make such a lovely website/blog about Bali Mauladad. I hope in am not mistaken in thinking that the Mauladad Family home was righy opposite the “Sikh Union” today known as the “Simba Union”. If so, My Gran-Father was a neighbour. Our Family House literally behind the Mauladad Family Home. Please confirm if I am thinking of the same family. Ps: Enjoy reading your Blog~and to know that someone is proud of his ancestor. Indeed the MAULADAD HOUSE was on Forest Road, across from Sikh Union Club cricket ground. MAULADAD family lived in this big house on a large plot of land; which had a detached guest house, garages for 3 cars, servants quarters and of course the TANDOOR, on the side of house covered under corrogated sheets . BALI IN LAHORE 1955 April. From Mombasa, I was in Lahore when I went to meet Bali, was staying in The FLATTIES, the only 5 star hotel in LAhore, on the Mall. Bali was busy organising the logistics for MGM shooting film BHOWANI JUNCTION. The leading actor was Stewart Granger with Ava Garner – attracted many, seeking autographs and Bali was happy to get these for them. BHOWANI JUNCTION was filmed in Lahore based on John Masters novel. university students in Lahore, from Kenya were with Bali who had arranged meeting the actress Ava Gardner and Stewart Granger. All MGM crew was in the Flatties Hotel. In Kenya MGM’s Richard Brooks filmed SOMETHING OF VALUE based on Robert Ruark’s book. The leading actors were Sidney Poitier and Rock Hudson. Bali helped MGM on this filming also – the helping was not for free ! Bali went on weekend safari with Afzak Chaudhri, my brother, someone senior from the Pakistani Embassy and others. They were chasing to get to some game , Bali driving his new Landrover, it hit a hole in ground (probably dug by wild dogs or hyenas, the front wheel went in, the long n short was, Afzal ended with cut earlobe on the gun rack. I understand the Pakistani official was smoking , he swallowed the lighted ciigarette, yuk, must have been painful. I had the pleasure of meeting him off and on when he used to be in Mombasa with Afzal Chaudri and Yaqoob ali . I just came across your name on this website. I presume you knew one Me Baldev Chibber of Nairobi. Me and my family members once visited you at your home in the fifties. Would be glad if that was the case. I believe Bali was gored by a cape buffalo whilst using a 416 Rigby. I was very young when I heard stories about “Bali” Mauladad. The biggest compliment was that he was very large hearted. I was close friends with Amu mainly due to Wanderers Cicket Club, he too was like his dad I am told. This brings back many memories and reflections, happy to remeber but also sad due to the loses. Ur April 28 2010 >i have just seen on 27th August 2011. YES > Baldev Chibber of Moshi was a good friend. He always came to see us whenever he was visiting Nairobi 1950s and his business trips to Nairobi were many times a year > sometime to see the marketing dept of Shell. Hi Everybody. I am proud to be related to Great Hunter Bali. He was the brother of my Grandmother. My Grandfather Mohammad Yaqub also lived all his life in Kenya. It is really nice to know that some of you still remember Bali with all the love and affection. May Allah (SWT) bless Mauladad family and especially Great Bali. Masood Akhtar from Luton, UK. Being the youngest daughter of Bali Mauladad, I feel I lucked out on all the great memories my older siblings had. I never had the pleasure to see my dad in his element, while on Safari with his Clients. However, I cherish the times I spent with my dad ! All of the above comments make me feel warm in my heart as if I was there to witness those past days. As the older generation leaves us one by one, these stories become more and more closer to my heart as if I am holding onto a fine string of pearls. Please keep the comments coming. Thanks to my wonderful and talented niece Sabah, to create this blog /website with lots of help from her dad, Zahid Mauladad. I new Bali very well indeed . A wonderful warm hearted and generous man . Sadly he passed away at too young an age , but I suppose burning the candle at both ends was the cause of that . We were both licenced professional hunters with the firm Ker Downey and Selby safaris , based in Nairobi . I was a comparatively young hunter , and was fortunate to do many safaris with Bali as his second PH . I learnt a lot from him . He was always very kind to me , and shared his wisdom willingly . He was an expert on big elephant , and had a nose second to none , when it came to instinct . Bali knew where to be at the right time and place . His success on big elephant was phenomenal , only rivaled by Bob Foster and Andrew Holmberg . Bali had a great affection for the animals he hunted , and in particular elephant . He would turn in his grave , if he knew about his precious jumbos being poached so ruthlessly in Africa as a whole today . The Long Bar at Nairobi’s New Stanley Hotel , was the watering hole and meeting point for the Kenya hunting community in the 1960’s and early 1970s . I was with Bali , his friend John Lawrence ( his rally driving partner , and a fellow PH ) and a couple of other hunters . A stranger approached us , and knowing Bali’s reputation , asked him how he was so successful in getting huge Tuskers for his clients, ” Simple , dear chap ” Bali advised , ” just go to the market , fill your car up with bananas , head for the bush . Then , look for baobab trees . At every baobab tree , attach several bunches of bananas . With profuse thanks the stranger left the bar heading for the market . We almost died with laughter ! When the stranger turned up at the bar a couple of weeks later , very irate , all the hunters beat a quick exite for the door , Bali leading the way , accompanied by hoots of laughter ! He was the original larger than life personality . We all loved him . Just before his death , at Voi , one of his favourite stomping grounds , Bali was badly gored by a wounded bull buffalo . If was not for the timely and brave action of Diwani , his ace Wata tracker , Bali would have been killed . The buffalo had Bali on the ground , goring him , when Diwani ran in , picked up Bali’s rifle , and finished off the buffalo . Bali was rushed to Mombasa and hospital . There he made a long recovery . I personally always thought that he never really got over his injuries , and was possibly a contributing factor to his early demise . Regards to all of Bali’s family – some body should write a book about him .